Last Wednesday, Representative Donato and I and the Arlington Town Engineer visited the Department of Transportation to inquire about plans for the Craddock Bridge. We met informally for about 30 minutes with the project engineering staff and their consultants. Representative Donato, in whose district the bridge sits, has strong concern about delays in the project — it ties in with Medford Square improvements. He expressed those concerns and the engineering team reaffirmed their commitments made in the formal meeting held last month. I share Rep. Donato’s concerns about timing and his advocacy is very helpful. My additional concerns were about the design of the project — from a flood control perspective, we want to see the maximum clear opening in the bridge. In a nutshell, the bridge was constructed in three stages — originally it was a two arch (single central footing) bridge; then it was lengthened and a boat lock was added on the South end. Finally, it was widened on the upstream side by adding a structure with several additional vertical supports. So, today, the bridge has two different cross sections — on the downstream side, there are only two footings (the original central footing and the sidewall of the additional boat locks), while on the upstream side, there are five or six. In the reconstructed bridge the cross-section visible from the downstream side will be extended all the way through the bridge, eliminating the additional footings on the upstream side. The hydraulic modeling indicates that this will reduce the flood impact from 8″ to 1″ in the “100 year” event. More importantly, it will make the bridge much less likely to catch debris which can greatly increase the flood impact. 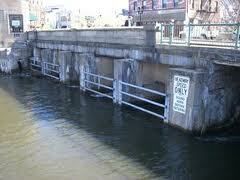 From a flood impact perspective the ideal solution would be a clear span bridge with no footings. However, the engineers feel that this would require a much deeper bridge structure to support the wide span. This is not practical given that there isn’t much excess headroom now — the bridge would need to sit above the current grade, creating problems with surrounding roadways and sidewalks. Additionally, historic preservationists want to keep the old granite arches. The intended design seemed reasonable.